Samantha's Bookshelf: My Travels Part One! 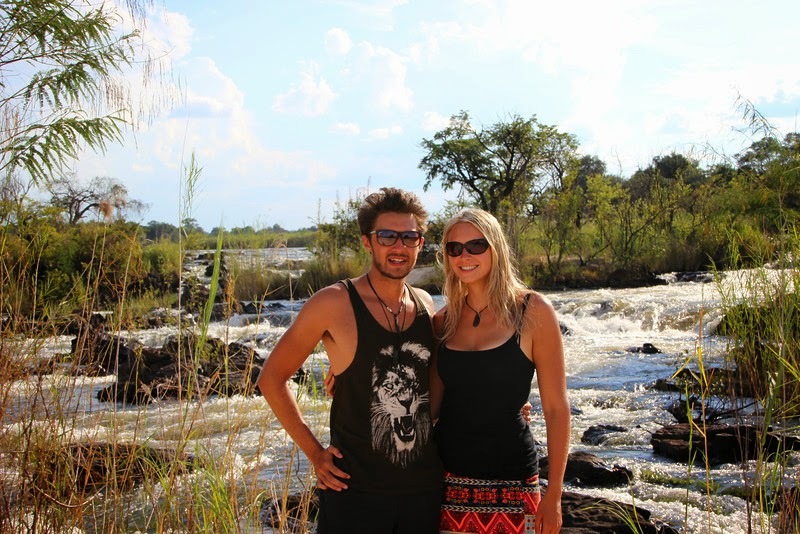 In February of this year my sister (Jess), her boyfriend (Sam) and me (Sam) and my boyfriend (Jesse) flew to Cape Town, South Africa to start out overland adventure. Now the name thing will probably get confusing…. I guess if I’m speaking about myself I’ll just say ‘me’. Jesse will always be my man, Jess will always be my sister and Sam will always be ‘boy Sam’, Jess’s man. It is rather confusing.. sorry! We had booked a 42 day tour with Africa Travel Co who I should point out were absolutely amazing. We had one short day on arriving in Cape Town to look around the city. 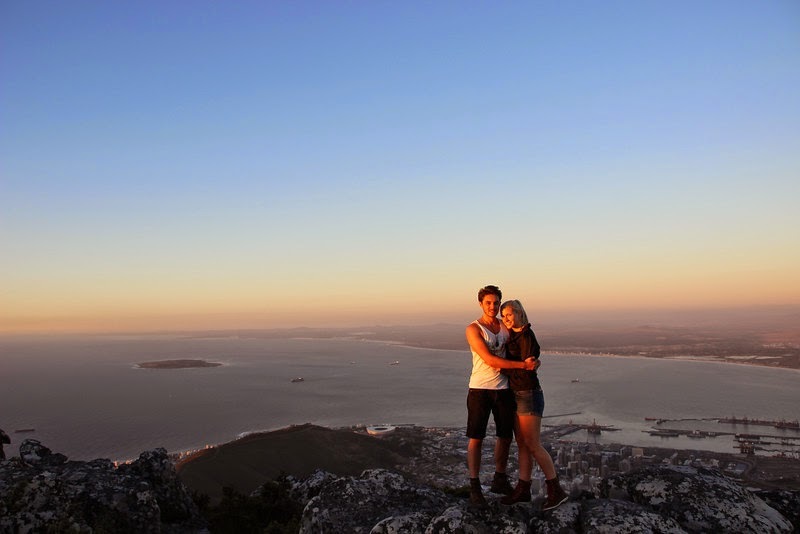 Jess and Sam were too jetlagged to come up to Table Mountain with Jesse and I to see the sunset which was a shame but we’re really glad we made time for it. It was incredibly spectacular! Table Mountain – such an amazing landmark. Simply beautiful. The next morning we set off on our tour. We had a reasonably small group – us (the four Kiwis), an Aussie girl, a Spanish guy and two Swiss guys. It was a very cool group. On top of that we had three amazing African crew – the tour guide and the driver who were from Zimbabwe and the chef who was from Namibia. Then we also had three trainees. Two very cool South African girls who were training to be chefs/tour guides and one South African guy who was training to be a driver. We were a very tight knit group and honestly, being with those people made the tour that much better. 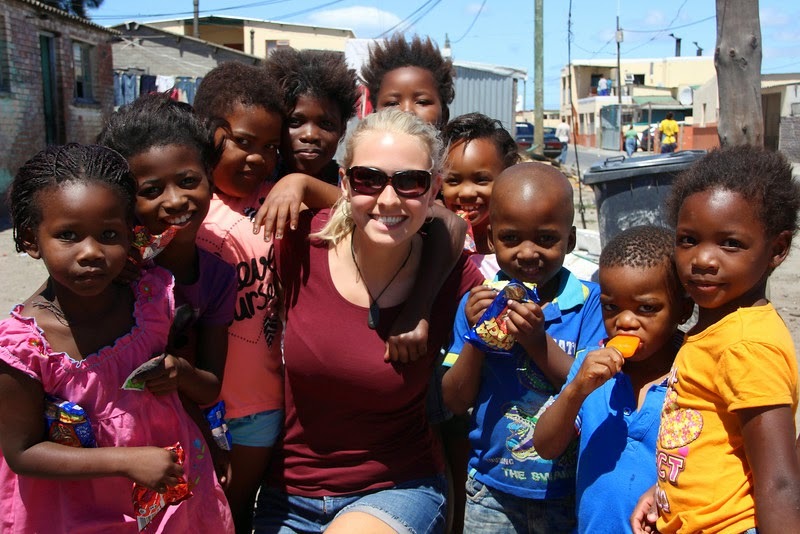 Our tour started on a Township Tour of Cape Town. This was heart breaking. I had no idea the huge divide that existed between the rich and the poor in South Africa. We met a family that lived in a tin shack just off the highway. I remember so vividly one thing the father said – “We fear for our lives every day. A car could crash off the highway flattening us all, or if a fire started, the whole township would be gone. We have thieves who spray fumes into our homes to knock us unconscious and then they take everything we have.” Then he said, “We wouldn’t want to leave though. This is our community. These are our friends and our family. We wouldn’t want to leave our people.” It was very humbling to see. They have so little, yet they’re very happy, very kind hearted, they will give whatever they have to make someone’s day a little brighter…. 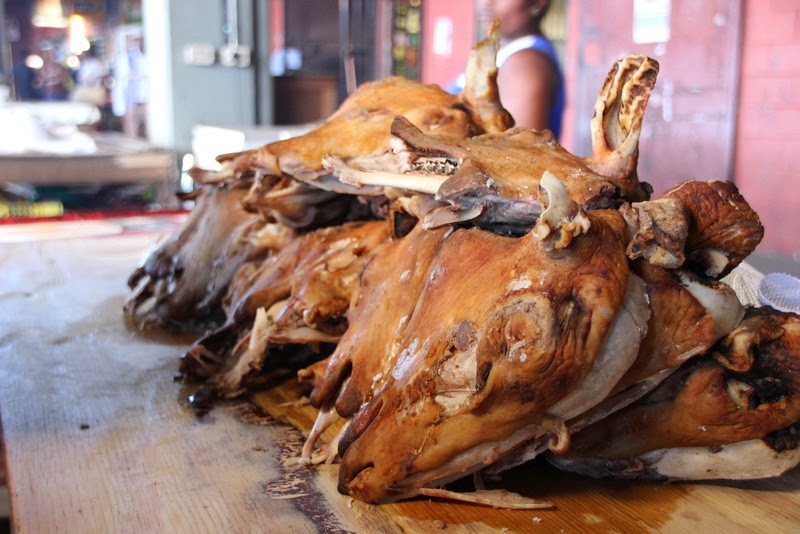 On this township tour we also visited a witch doctor, tried homebrew beer and were taken to the Township’s “food hall” where we tried sheep’s head/tongue and played pool with the locals. I should point out at this point given I don’t eat any part of sheep or cow in usual circumstance there is no way I was going near the sheep head. Jesse said it tasted like beef. Jess said it wasn’t too bad, yet she hasn’t eaten meat since. Eating that sheep head turned her into a vegetarian! Ha! Once our township tour was up we started on our journey, driving up into the Cedarburg region of South Africa. This was basically just a pit stop but a great chance to get to know the rest of the group. 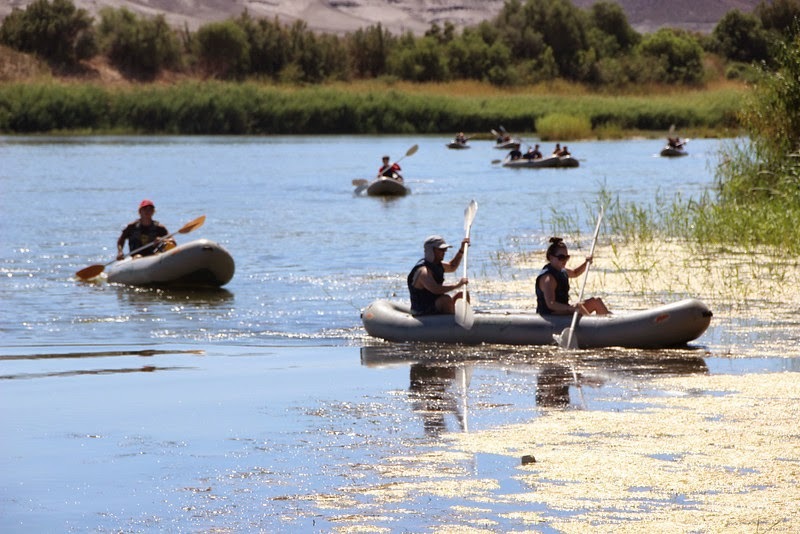 The following day we headed toward Orange River on the border of South Africa and Namibia. Such an incredibly beautiful location, the camp we stayed at was right on the river, we could jump straight in from the floating wharf and given it was the middle of summer it was hugely refreshing. 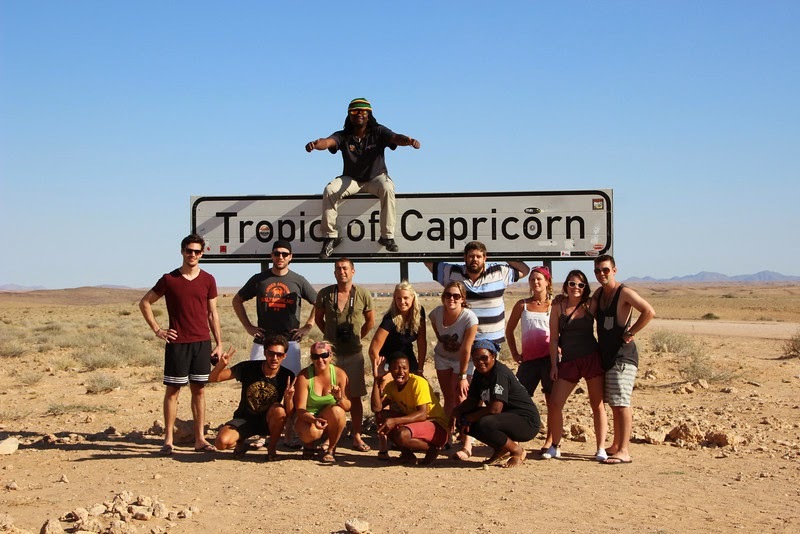 That night ended up being a big party night, getting to meet the Nomad tour group who were taking a similar route from Cape Town to Vic Falls. Most of the group woke up the next day with extremely sore heads (I’m not really a drinker so I was right as rain!) yet they still were up bright and early to go on a canoe trip down the river. Once they returned (I decided to stay behind and sunbathe!) 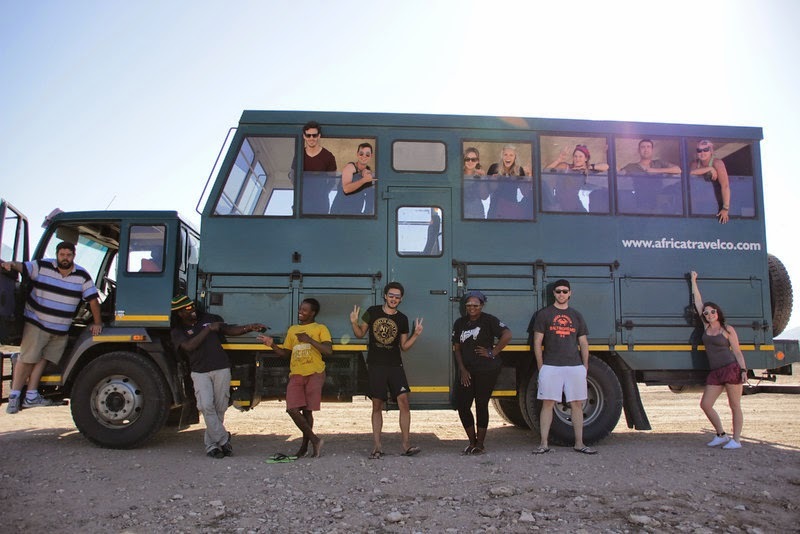 we jumped back in our truck and headed further up into Namibia. It was hot. Namibia is hugely a desert country and oh my goodness. It was the first time I have ever experienced 52 degree Celsius heat. We were using fast melting ice cubes to try and cool us down! It didn’t help that we were stopped at a road block in the heat of the day for over an hour! Namibia was by far my favourite country on our trip. 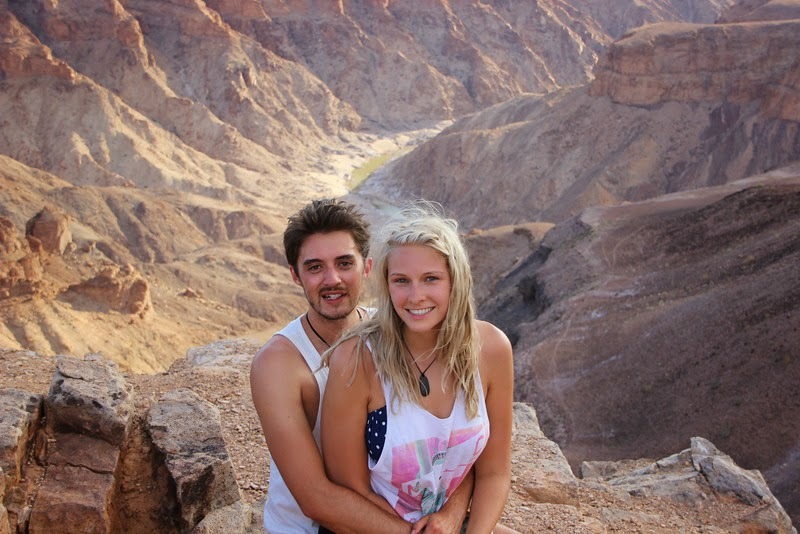 On our first days in Namibia we watched the sun set over Fish River Canyon which is the second biggest canyon in the world after the Grand Canyon and we swam… a lot! The first animals we saw were zebras… that was exciting! Oh and then an Ostrich! I love the way they run! 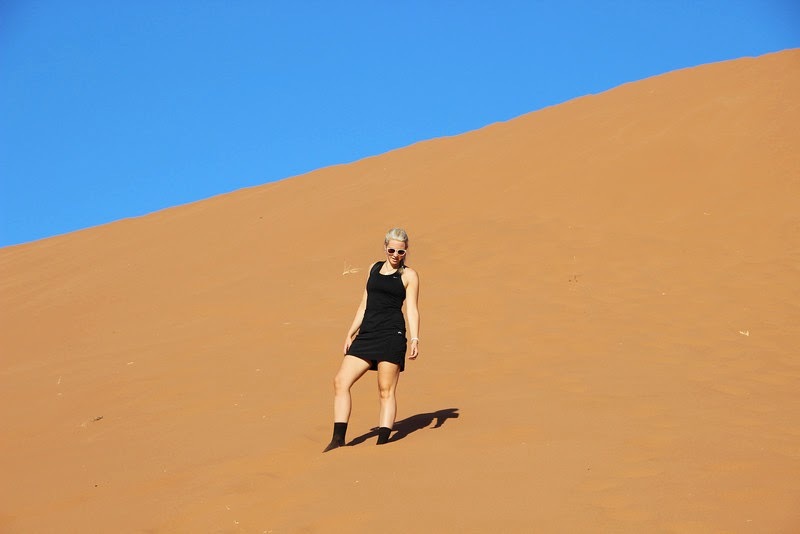 One of the highlights of this point was the Namib Naukluft National Park which is full of brick red sand dunes. They’re incredible. We hiked to the top of one and caught the end of the sunrise which was amazing. It was so hot though! We had brunch sitting at the base of the sand dune and it truly felt so peaceful. We were even visited by a sprinbox and a jackal! Both really beautiful creatures. After brunch we headed out to Sossusvlei and in particular the Deadvlei– my gosh what an incredible sight. 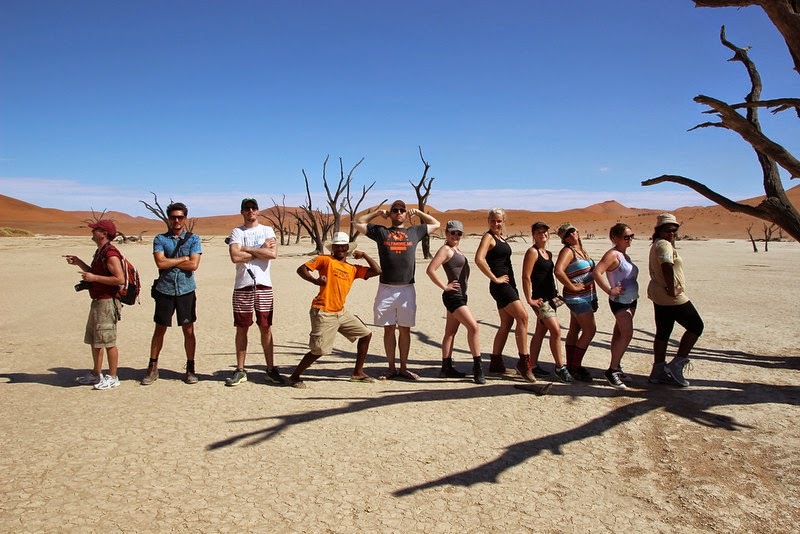 The Deadvlei is a clay pan right by the “Big Daddy” sand dune. The ground is entirely white and the trees have been scorched for hundreds of years and their skeletons remain. The blue sky and the sun reflects on the white ground and everything seems like it’s hyper-coloured. The sky gets so blue, the brick red sand is so red… it’s amazing. After the desert we headed to the coastal town of Swakopmund where we could do some shopping at the markets, Jesse and I did a township tour which was even more heart-breaking than the first one, especially the orphanage where we met a small boy with a giant tumour sticking out his head… and no money to get it removed L. I spent SO much money at the township craft store which they were very thankful for… Jesse was so confused why I came out with a maraca…. I’m sure it’ll come in handy some day! We also went sandboarding and quad biking which was very cool. Such a fun place! Our two Swiss boys ended their tour here which was sad and they were replaced by two more Aussies. 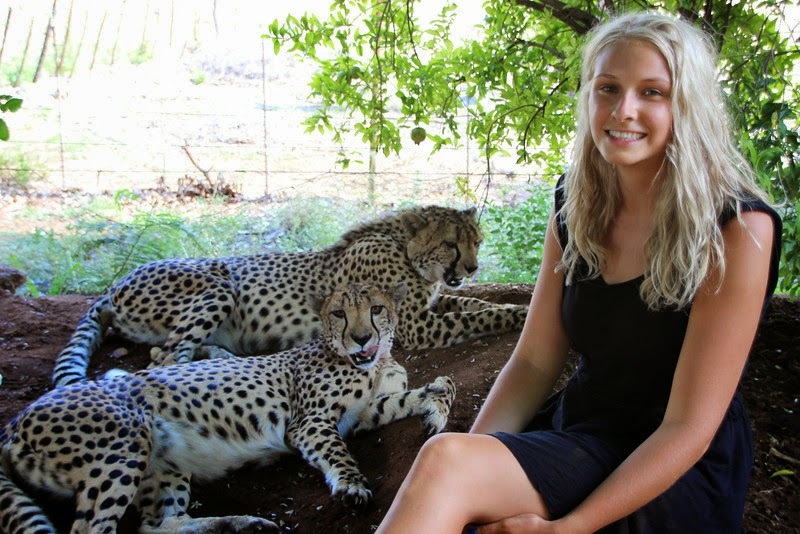 rehabilitating injured cheetahs. We got to pet them which was so incredible. I did slightly freak out at one stage when one went for my shoes! But they were lovely and beautiful animals. 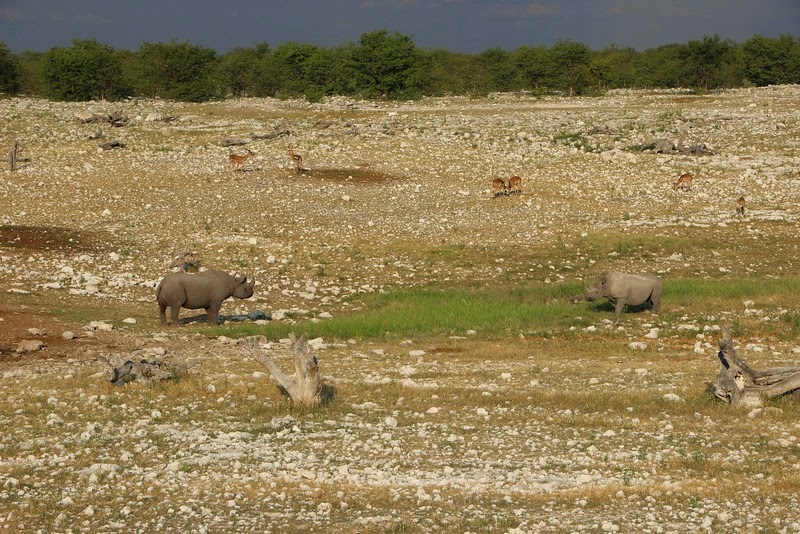 Following that we headed up to Etosha National Park… and oh the things we saw! The giraffes were actually my favourite. Incredibly graceful creatures they are. Although the lions were pretty cool too. 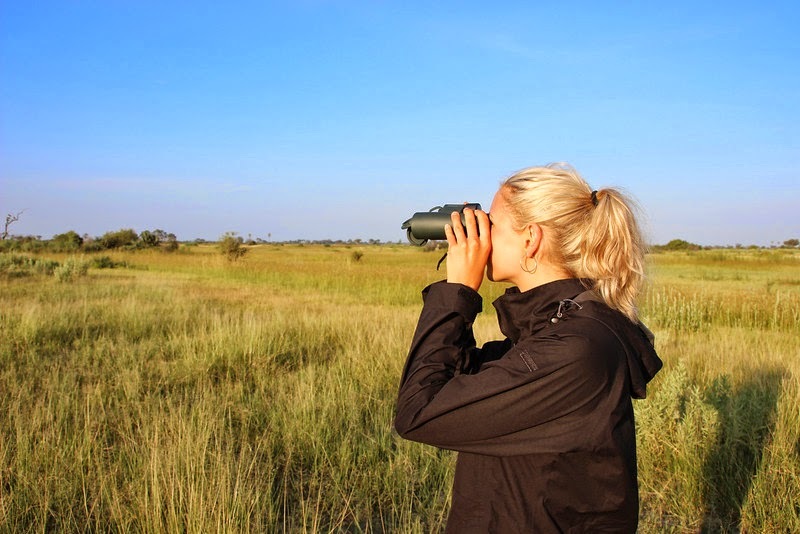 There were plenty of springbox, impala, zebra, oryx, wildebeest, dik-diks, antelope and so much bird life. There were three big highlights for us in the park. The first was seeing a black rhino (they’re super rare!) and a white rhino go head to head over territory at a watering hole. Normally a black rhino would win but this was a reasonably young black rhino. After staring at each other for a while the white rhino claimed the territory and started to drink. Black rhino wasn’t so happy about that, so they stared each other down a bit longer then decided to become friends and drunk side by side. No kidding! 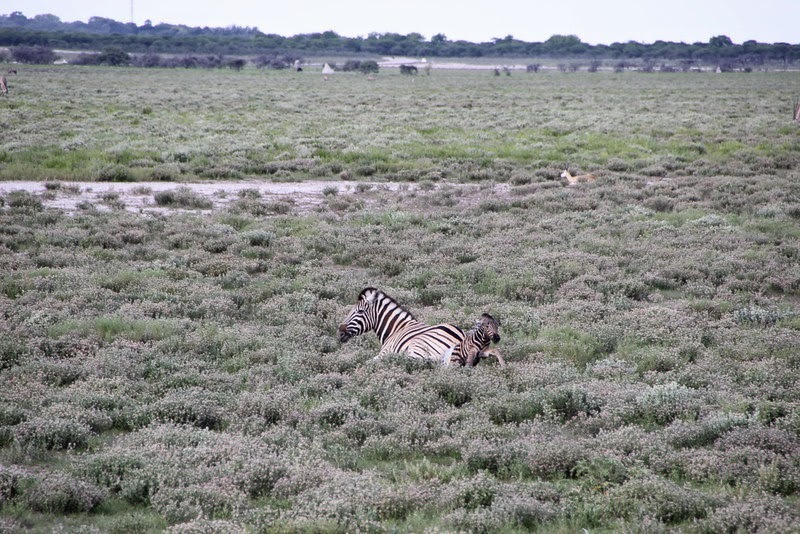 The second highlight was seeing a zebra give birth! It was such a beautiful thing! We watched the whole thing right from mummy dear pushing with all her might to the first steps taken by the baby zebra. We even named it, it was so cute! Unfortunately this is Africa… and you know, circle of life. Half an hour later a lion got a bit hungry and dragged the new baby zebra off for a feed. It broke us! The third highlight came early the next morning. We took a drive through the park and came across a giraffe hanging out with an group of impala. Suddenly the impalas went on alert and started making this clicking noise. The giraffe bolted and then out of the hedges came a leopard! 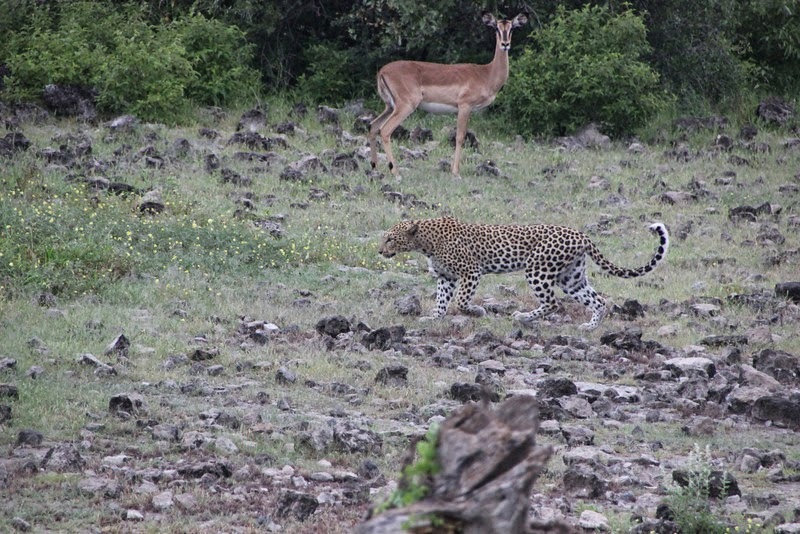 It walked around for a while before realising there were too many impala to make a move so it stalked off. In its wake came a pack of hyena. Those lazy hyena are too lazy to make their own kill so they follow leopards around hoping to steal whatever they’ve killed that day. 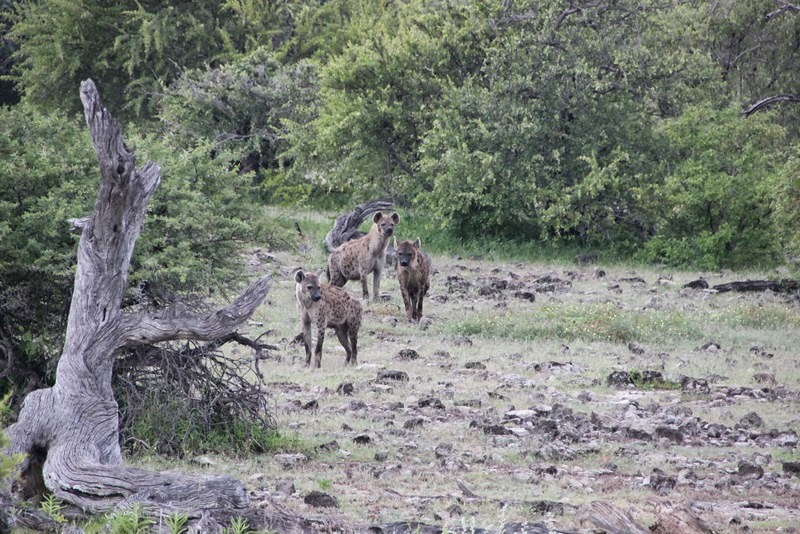 The hyenas then faced off with some wildebeest but decided not to make a move. It was VERY tense! 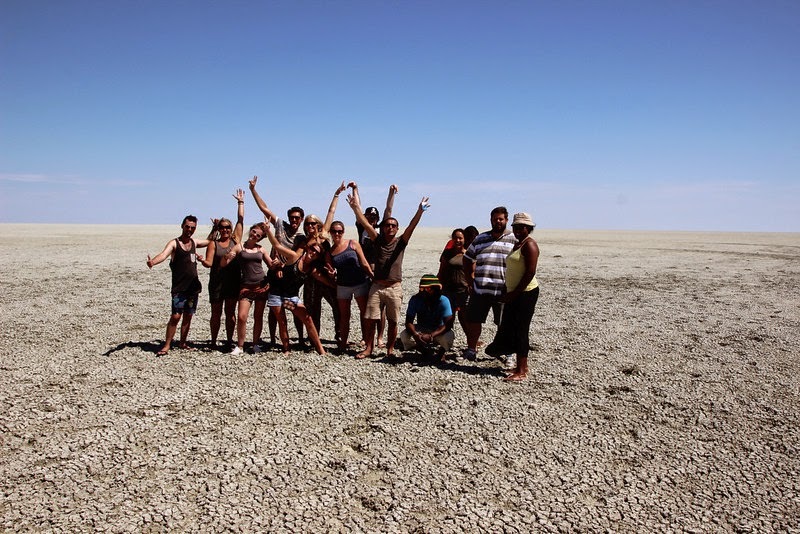 After our crazy nail biting morning we did something a little more low key and visited the salt pan of Etosha. The Salt pan forms part of the Kalahari Basin (Speaking of Kalahari, YA author Jessica Khoury has a book coming out next year set in the Kalahari region. Funnily enough it's called Kalahari. I can't wait, it's going to transport me straight back to this incredible place. In my head of course! Add it to your 'to read' pile, now now now! So anyway, the salt pan forms part of the Kalahari Basin and is a 120km long lakebed which is pretty much completely dry... well sort of. It's like dry mud coated with salt (which means you do sink straight down into the ground as you walk on it. All good fun! Anyway, it's quite a sight, some of the girls even got down and gave it a lick to see if it tasted like salt. Verdict? Yes it did. But had a slight after taste of mud. 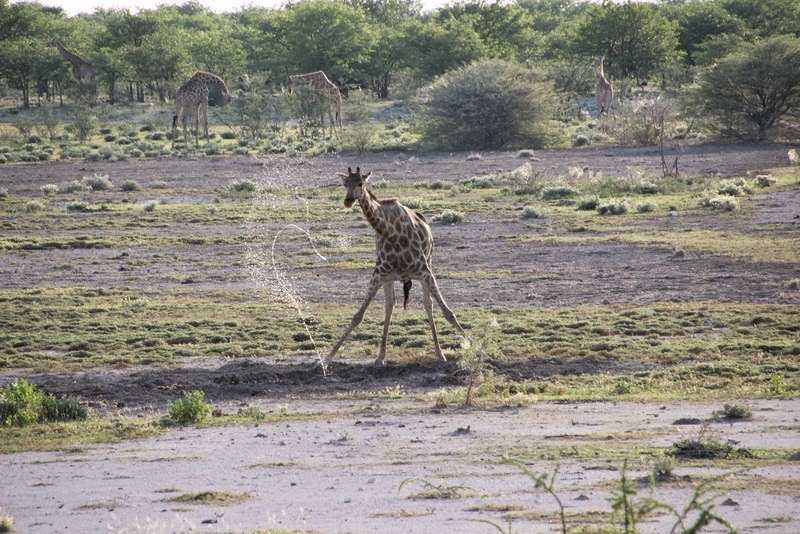 Magestic giraffe taking a drink! 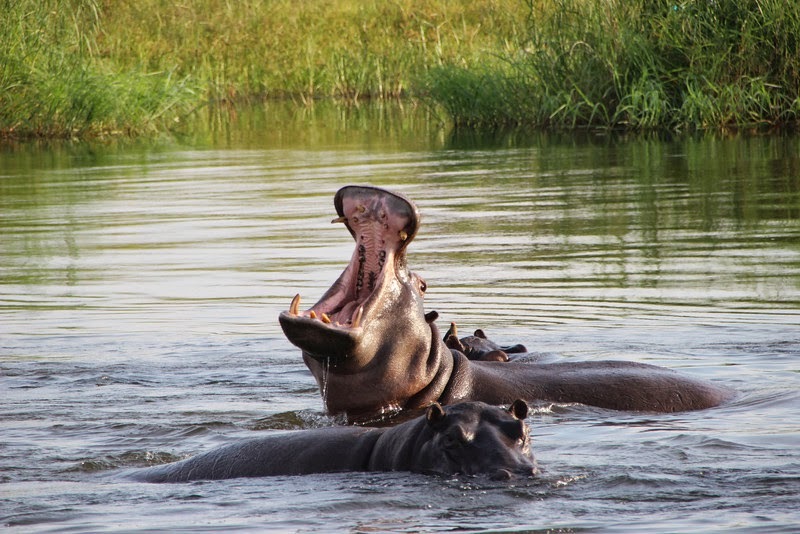 After Etosha we headed up to Botswana where we took a river cruise and saw some hippos. I really don’t like hippos. Do you know they’re the most dangerous animal in Africa? They will charge at you, snap you in half and then drop you to let you rot…. They’re vegetarians. They’re not killing you because they’re hungry. They’re just killing you because they see you as a threat. Pretty awful. One walked through our camp once, was pretty scary. There are funny though. They ‘laugh’…. I don’t know how I can describe the noise they make but it’s like .. meh..he..he..he….heeee. It’s hilarious. From there we headed to the Okavango Delta. Oh my goodness the beauty!! 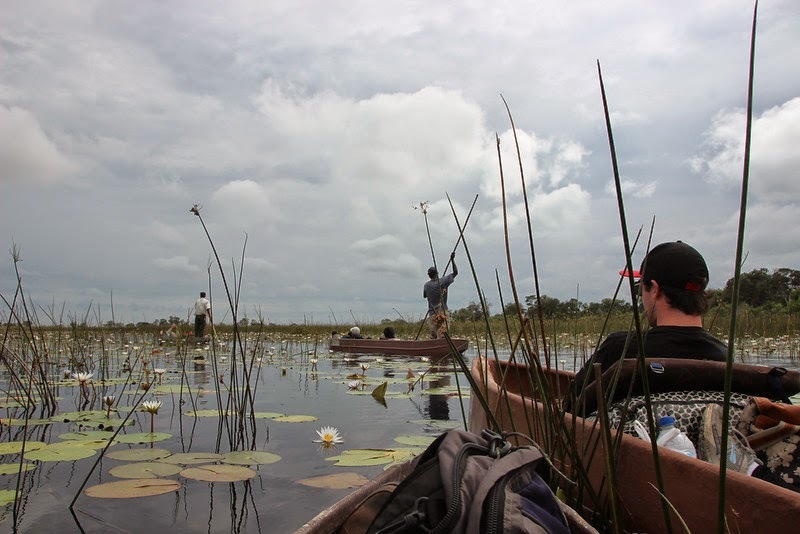 We were taken into the delta in mokoros which are dug out canoes, poled by locals. It was so relaxing. Every single one of our group managed to fall asleep in the hour and a half journey. We were guided between the reeds ….. it was just magical. We spent the next few nights bush camping under the stars. We kept a fire going at all times to keep the animals away from our camp (although we’ve heard stories of lions, elephants and hyenas all visiting the camps!) and by night we watched the fireflies dance. 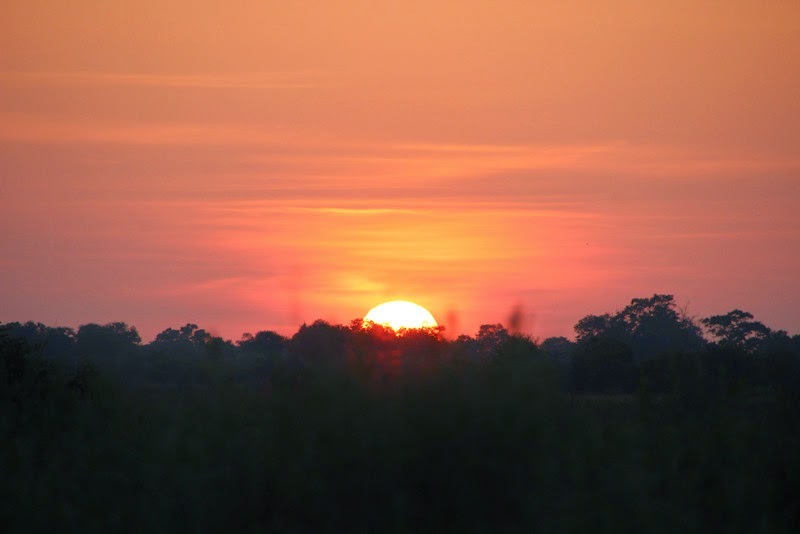 We did quite a few walking safaris through the Delta which was awesome – saw more hippos, a giraffe (including a giraffe skeleton), warthog (PUMBA!!! ), Zebras, wildebeests, and lots of birds. I saw a hyena too. Eagle eyes they called me. (Only me and the guide managed to spot him). On our final night the locals performed some songs for us around the campfire and we all performed songs from our home countries. It was very cool. After our time at the Delta we headed up to Chobe National Park where we did another overnight bush camp in the middle of the park. A little scary to be honest! We had an elephant visit us for dinner which was an experience. I love elephants but if they feel threatened …. They’ll charge! Luckily she was just wandering past. 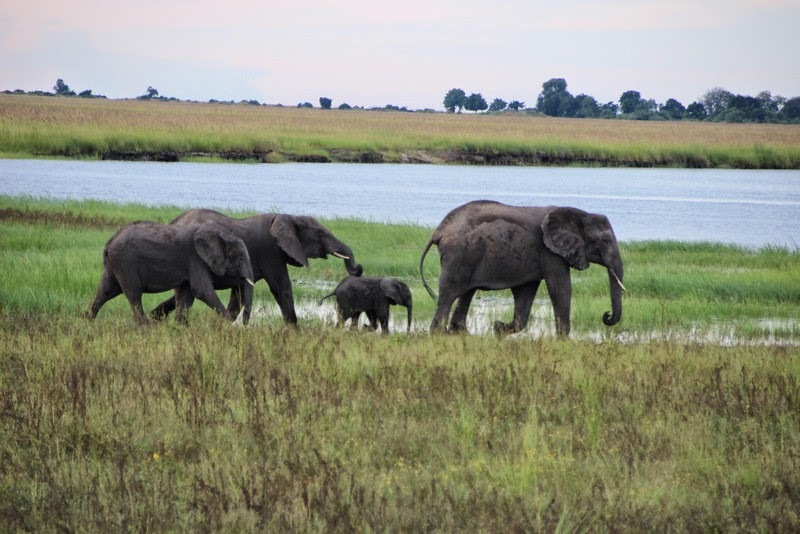 We saw a lot of elephants in Chobe. 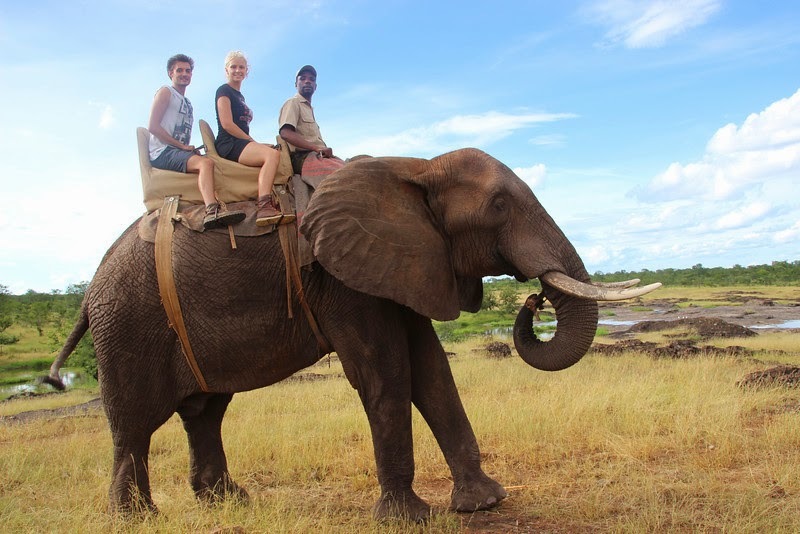 It’s the place to be to see elephants! We also saw Cape Buffalo meaning we’d seen all of the Big 5, a plenty of baboons. The Lilac breasted roller was my favourite bird, and we saw lots of hippos, eagles, giraffes… so many animals honestly it’s hard to remember all their names! Chobe was awesome, a great place to visit. From there we headed on up to Victoria Falls. Such a beautiful place. The falls are incredibly impressive. We also went elephant back riding (it’s safe for the elephants, not like the ones in Thailand that really hurt the elephants). Earlier that morning we'd gone walking with lions (they’re lions that are part of a breeding programme to help get the dwindling population of lions back up. 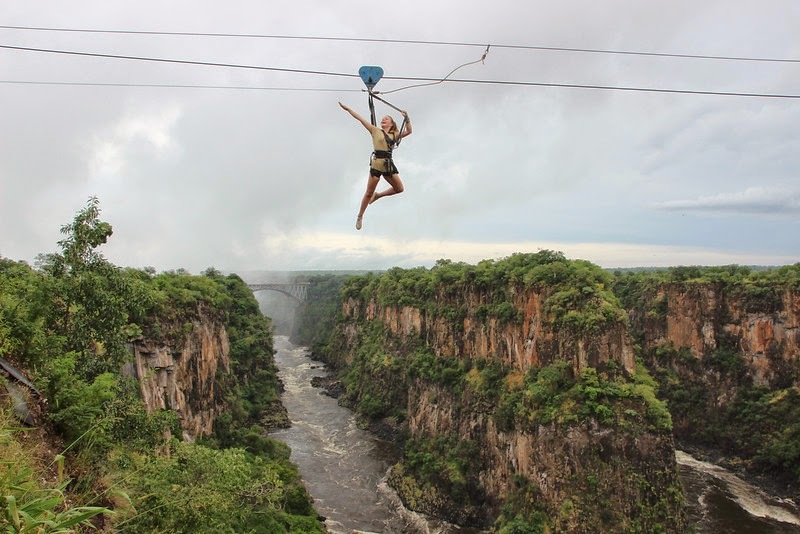 All money raised goes to the programme) and zip lining – oh my gosh I was so scared! It was a lot of fun though. We had quite a few nights of partying as well as it was out last time with our amazing group. We’d called ourselves Jabulani, which was the name of our truck and means happiness in Afrikans. I miss them all terribly! You can see the sheer terror in my face! Botswana. He didn’t get to come to Chobe with us the first time around, spending all his time vomiting instead which was crappy. 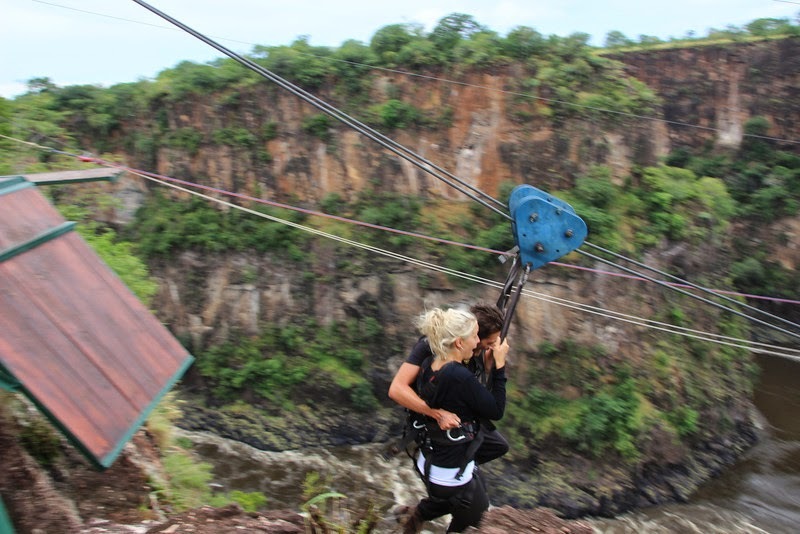 By the time we got to Vic Falls he was still quite unwell. We ended up having to go to a doctor in case he’d picked up Malaria –he hadn’t. It was scary though… and those third world doctors, wowee it was an experience. Especially the chemist where we picked up the medicines, it was like a back alley drug deal, so crazy.